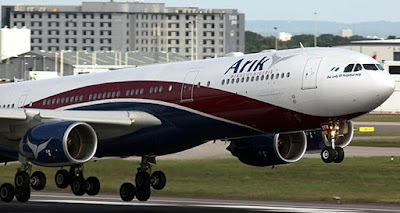 Management of Arik Air Limited has filed an N20 billion suit against the Federal Ministry of Transport, Attorney General of the Federation and Ethiopian Airlines over claims negotiation negotiations for the acquisition of the airline have begun by the latter. Recall February 2017 saw the airline being taken over by the Asset Management Company of Nigeria over poor management, inability to service its debts and pay employees’ salaries. The airline's attorneys Babajide Koku (SAN), Mr. Chukwuemeka Nwigwe and Mrs. Ezinne Emedom, on September 6th, filed the lawsuit at the Federal High Court Lagos. They are requesting that a stop is put to further negotiations of the airline by the Federal government and the Ethiopian airline. “The plaintiff avers that the agreement of the second defendant with the first defendant will be wide ranging and intricately affect every aspect of the plaintiff herein, including but not limited to the day to day running technical as well as financial management which will affect the plaintiff as being the largest domestic and regional airline in Nigeria. The plaintiff further avers that the action taken by the first and second defendants will have a negative effect on the country’s image as the plaintiff being the largest airline will be pawned over to another country for management,” it said.